Learn to quilt step-by-step while completing a medallion-style quilt designed by Michigan quilter and teacher, Nancy Roelfsema. We’ll start with a simple “rail fence” block to teach you proper rotary cutting, scant 1/4” seams and correct pressing techniques. 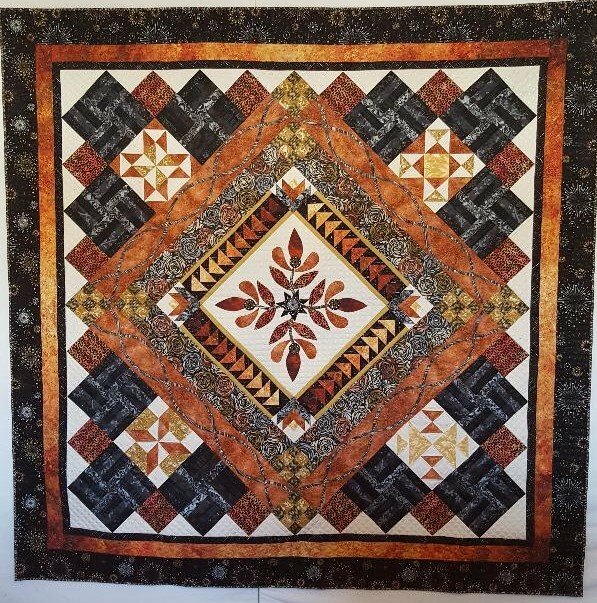 We will move on to progressively more challenging blocks and methods including strip piecing, half-square triangles, paper piecing, applique (both hand and machine), setting triangles and adding borders. We will even baste and start quilting your quilt top. You will also receive a binder with instructions and companion video lessons for each of the sessions (weekly fee). The skills you learn in this series will enable you to tackle future quilt patterns with ease and confidence. Click here for a printable fabric list. Materials Included: Fee is a teacher fee. There will be a additional $5 weekly fee which will cover the notebook and the days lesson.